Fox Terrier Fun Walk #2, originally uploaded by Forever Foxed. Brought to our attention by the lovely Jackie at Forever Foxed this event is organised by Fox Terrier Rescue. Not just for Fox Terrier’s (us Welsh Terrier folk are muscling in too of course!) but for friends and admirers of, it’s a great chance to meet and find out more about the breed. 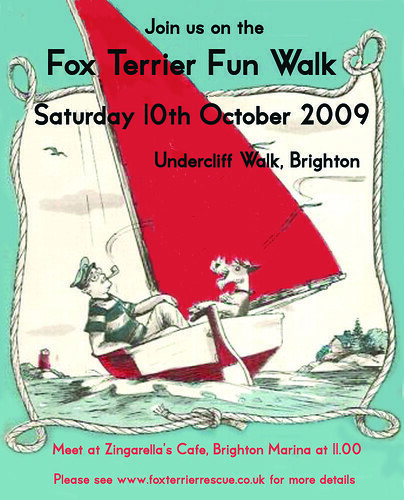 Meeting at Zingarella’s Cafe, Brighton Marina at 11:00 am for the Undercliff walk. We’ll be there in spirit! Have got it on the calendar and we’ll look forward to a report with pictures!!!! WE will see you there Edwyn! So….. how was the walk????? Did you see Sally and Jackson? Will some pictures be forthcoming??? Please? Pretty please??? ?